Rencho arrived at Kominato of Awa in the hometown. He feels nostalgic about the smell of the tide of sea. Rencho walks the slope of the mountain. He saw there was the Seichoji Temple uphill. There were Buddhist priests of the child. Probably they would get tired of the cleaning of the door front, because they forced the leaf which they collected each other. Rencho called to them smilingly. Boys suspected a priest to call to intimately, but noticed it before long. When Rencho nods, boys run in a hurry to the main hall of the temple. He entered the precincts of temple. His parents, Dozenbo, Jokenbo, Gijobo, O’ama meet him. Rencho greeted them with a broad smile. "I , Rencho, just have returned from the Enryakuji Temple." Umegiku of mother is already filled with tears and was going to call to a child, but words fail her. Dozenbo put hands together seeing the figure of the smart and manly Rencho unintentionally.Nun O'ama smiled like seeing the growth of her child. Jokenbo and Gijobo of the senior disciple looked at Rencho who has grown up and become really big, with dazzling eyes. And boys are looking from the back of adults with interest. Night has advanced, and a banquet began. A boy hits the hand drum. Rencho sat down at the head of the table, and Dozenbo and O'ama sat down on his both sides. Enchibo, Jokenbo, Gijobo and other priests of Seichoji temple lined up on the left side and Mikuni Tayu of father, Umegiku of mother and believers of the Seichoji lined up on the right side. Everybody talks with a smile in admiration that Rencho grew up magnificently. Mikuni Tayu was proud of praise for Rencho, and there was the feeling embarrassed, too. Umegiku was just glad that Rencho came back to the Seichoji safely. On the other hand, Rencho was thinking about the tomorrow's first sermon with the eyes which occasionally gazed into afar. The next morning, the precincts of temple were still dark. Dozenbo looked in the room of Rencho so that he shares a religious service of the morning, but he cannot see Rencho. He asked a boy monk. "Yes, he already said that he went to the Kasaga forest and went out." There was the hillside which could look around the Pacific. Kasaga forest was going to greet morning, but it is still dark. There was a sea of the large Pacific large just in front of Rencho. The eastern sky is lightening. Light sparkles beyond the horizon subtly. It was the morning of 28th in April, 1253. The sun which did not change during several billions of years shined now and rose. Rencho chants it with a vibrant voice to the universe. Renchō left Kamakura and made for Mutsura, present Yokohama. This is because he gets into a boat. A ship arrived at Awa early and comfortably than person goes around around Tokyo Bay on foot. But it was cumbrous that there was the checkpoint on the way. People crowded in front of the checkpoint. Travelers take out money and pay it to a government official. The person without the money held out brown rice. This checkpoint was built just recently. Therefore, all the people were getting angry. A priest was chatting with a samurai in the hall of the checkpoint. That priest wears a poor priest robe, but he gains weight a little and looks healthy. He was called the name Ninshō, and a popular name was called Ryōkan. He is from Yamato. He climbed Mt. Shigisan at 10 years old and trained himself. At the age of 17, he received the religious precept at ordination hall of Tōdaiji Temple. He studied under famous Eison as a distinguished priest about Shingon Religious Precept sect and, at the age of 24, became a priest. And he went to the Kantō district in 1252 and entered Kamakura in 1262 and spread Religious Precepts Sect. This Buddhist priest has been receiving strong trust of the Shogunate. Gokurakuji temple is founded in 1259 by Shigetoki Hojou of the third son of second regent Yoshitoki Hojo, and Ryokan becomes the founder. Ryōkan has been managing this checkpoint. It is unexpectedly that a priest managed the means of transportation, but a priest was engaged in the administration of such facilities mainly in those days. It is not long since the samurai ruled the state. The Shogunate which Hojo leads is not stable in its finance. Samurais spent all their time with battle until now. They do not have senses of economy at all. Even if they were good at the struggle, the ability for rule was no match for the court noble. The public works projects to build a bridge and the road are impossible in this. From the plan of knowledge, experience and the money of the administrative technique, Buddhist priest belonged to an educated class, and the priest who had abundant financial power played a key role, and the maintenance of the country was pushed forward. The center of the politics is Kamakura, but the economy is Kyoto at that time. It was priests from Kinki to have grasped a fund of Kyoto. Ryōkan gained the favor of the Shogunate by the abundant fund again and strengthened power. What we think he is from Todaiji is a large-scale fundraising activity for the rebuilding of the Great Buddha of Nara which was performed 70 years ago. He from Todaiji Temple learned this collection system of money and came over to Kanto. The person that Ryōkan was talking with was Shigetoki Hojo. He is a strong believer of Nembutsu. His father is Yoshitoki Hojo who built the prosperity of the Shogunate. Therefore, Shigetoki got an important post of the Shogunate for granted. Nagatoki, his child, became the regent after succeeding Tokimune. It was famous lineage among Hojo. Shigetoki took a cup in satisfactory mind while looking at the checkpoint. 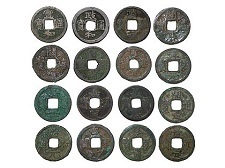 Government officials of the checkpoint carried a large quantity of money, the Sung Coin which imported from China (note), which they gathered it from passersby. The copper money has a hole midmost. Government officials thread this hole with a string and make thousand. These 1000 pieces were called one kan in those days. One kan is 180 liters of rice, and the then value of money is approximately 50000 yen in the present. Money called thousands kan was piled in heaps in this way. The rice was piled up like a mountain, too. The people called this "the rice in the checkpoint of Mutsura". Ryōkan and Shigetoki Hojo talk peacefully. Pot-bellied Ryōkan begins to talk to Shigetoki in a tone to persuade. "I am thankful. Because the ascetic practices of the Ritsu sect have only to follow religious precepts, it is easy." Shigetoki nodded for a proposal of Ryokan as having had thought came true. There was Renchō in the line of the traveler sullenly at the entrance of the barrier. He took out the money from the bag and offered it to the officials. At that time, they could hear people's voice of the front gate. All members proceed to the entrance hall. Buddhist priests of the temple are quarrelling with samurais who rode a horse at the door front. One of the samurais, Kagenobu Tojo of the land steward was staring with a fearless look. He is a guest who has not invited. Disappointment clouded their features. Kagenobu Tojo looked down all people of the Seichoji Temple. Young Jokenbo glared at Kagenobu and criticize. He is a senior disciple to Renchō. Kagenobu looked the other way. "I manage this whole area. I am ruling this land by the instruction of Kamakura shogunate that is leader of the samurai family." Likewise, the senior disciple Gijobo rebutted with determination. Kagenobu do not hear in silence. He retorts to Gijobo by the authority of shogunate. This issue is about the crisis of the Seichoji temple. Jokenbo hunt down Kagenobu without flinching. "You appeal to Lord Kamakura if so and should decide which is right!" Dozenbō could not bear to see the fight between his disciples and land steward and stepped in between them. "Steward Kagenobu, actually, the person who is called Rencho of my disciple finished long ascetic practices in the Enryakuji Temple and will return here today or tomorrow. We are busy with preparations to invite him to now. Excuse me, but it is not quarrelling time now." “Well. I come again sometime soon, but you should prepare. If you have the slightest an unpardonable thing, I come to control you." In opening up the Kamakura Shogunate, Minamoto Yoritomo dispatched the samurai to his ruling place and set up land stewards and governors. Although he entered the ruling area, it was not the whole country but the eastern area from Kinki, and in addition it was out of the territory of the temple. However, the fight of the boundary line happened consistently when a land steward was installed next door of the territory of the temple. There was Awa country on the south edge of present Chiba Boso Peninsula. The sunlight seemed to be subtropical. The temple in the middle of the mountain, Seichoji was looking down the Pacific Ocean. Unlike the capital here, there is calmness. In the temple, the little monks were sweeping out the wide gate. A laughter sounded at the auditorium of Seichoji Temple. The statue of the Bohisattva Space Treasury, the principal worship, is being enshrined in the auditorium. People waiting for the return of Renchō were in this auditorium. Tayū Mikuni is the father of Renchō, mother is Umegiku-nyo, Nun O'ama of the believer from old times, Dozenbo of the chief priest, Jokenbo of the disciple, Gijobo and others were sitting down in a ring . Nun Ō'ama is a strong supporter of this temple. Dozenbo is the teacher of Renchō. Gijobo, Jokenbo are the senior disciple of Renchō. Everyone knows Renchō from childhood. Obliging Nun O'ama talks smilingly.
" Renchō was really a smart child. Everybody was to know, I had favored Rencho since he was young. Twelve years has already passed since then. It will be that he certainly became an excellent priest." O'ama was a widow of Hojo Tomotokiin that was the founder of Nago'e branch family in Hojo clan. Tomotoki’s older brother is Yasutoki Hojo who is famous as a great politician. Nun Ō'ama was rooted in this land by the relations that her husband was the feudal lord of Awa..
She is willing to care people, and favored parents and child of Renchō and provided mental and material support. Tayu Mikuni humble lower his head to O'ama whom he met after a long absence. "Rencho became a priest by help really of nun O'ama in this temple and was able to train himself in the Enryakuji Temple. I would like to thank you again as a father." The Umegiku of mother also bowed her head to O'ama with the gratitude for Rencho growing and going toward the Seichoji safely. "I was impatiently waiting Rencho became an excellent priest and came back to this Awa. Besides, there is not such a happiness elsewhere as mother to listen to sermon of Rencho in this temple which he climbed at 12 years old. " O'ama talks to Dozenbo of the aged chief priest. "He seemed to have done considerable ascetic practices in a famous temple with a venerable history of Kyoto and Nara such as Shitenno-ji Temple or Yakushi-ji Temple including Mt. 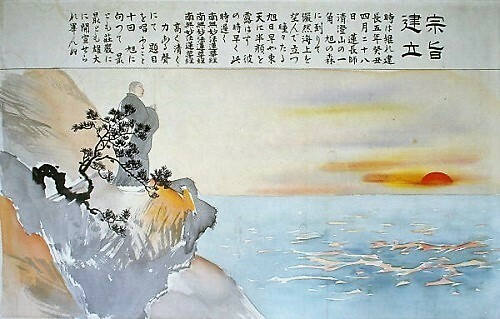 Hiei-zan. I am very looking forward to what kind of sermon he does." Dozenbo has begun to talk artlessly. Dōzenbo looked after Renchō from 12 years old to 20 years old and brought him up. He is existence like second father for Rencho. Nun Ō'ama begins to chuckle. "Hey, Dozenbo's anxious mind began again." All members had contagious grin. It was peaceful atmosphere, but there was the person who was not glad of Rencho coming home. Old priest Enchibō and Dōgibō whispered at the corner of the temple. There is the power struggle in world of any place. Enchibō and Dōgibo were influential people of the Seichoji Temple. Especially Enchibō bowed three times for one character in the Seichoji and spent three years writing the Lotus Sutra [note], and he memorized ten text of the Lotus Sutra. And it is said that he had read two texts of the Lotus Sutra in single night a day during 50 years. The masses of the temple praised that Enchibō is sure to become the Buddha. Therefore, he was arrogant. He was ruling Seichoji Temple together with Dōgibō. However, the young monk who returned from Mt. Hiei will appear here. They cannot feel interesting. "Sad Dharma Pundarika Sutra" (The sacred book which is clean and mysterious like a white lotus flower) in Sanskrit. As for the translation in Chinese, 16 kinds have been conveyed including partial translation and a different book, but three books exist with complete form. Among them, because the translation of Kumarajiva spread most widely, in general speaking of the Lotus Sutra means his translation. 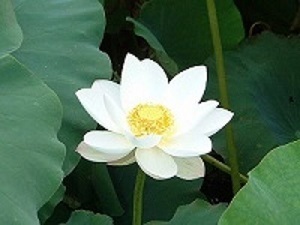 The reason why Buddha assumed the symbol of this sutra a white lotus flower is because a lotus flower blooms from mud unlike other trees and plants. Because this makes a clean large white bloom without being stained with mud meaning worldly desires, it is said that shows the idea that worldly desires themselves are Buddhahood. In addition, the lotus flower symbolizes that cause and effect are simultaneous together because it let fruit (underground stem) bloom at the same time. The place of origin of the lotus flower is India, and it is thought that a lot of lotus flowers grew in the area that Shakyamuni Buddha propagated. The Lotus Sutra in the Latter Day of the Law is Nam-myoho-renge-kyo of the three great secret of the Law, Nichiren Daishonin preached it. of Tatsunokuchi (the mouth of the dragon). He could see Enoshima Island. Now, high-rise buildings line up and are full of a surfer and tourists, but there was the place of execution place there in those days. Even now, human bones that are supposed to have been executed are found near here. A sinner was brought to Tatsunokuchi.. There was a hole in the center of the sandy beach for cutting off the neck. The official tells a crime sentence. The officer of beheading drew a sword bluntly. The sinner who had been quiet until now has acted violently as soon as blindfolded. "No, please help me, I do not want to die." The officials surround sinner, suppressed him, and push his neck into the hole. The officer chanted "Namu-Amida-Butsu", cutting off the sinner's neck with a single blow. The scream of the crowd broke out. Rencho stayed overnight at a temple of his acquaintance and walked the downtown of Kamakura again. He visited the temple belonging to the Zen sect. More than a dozen samurais are sitting with crossed legs for meditation (note). The Zen Buddhism was popular among samurais explosively mainly in those days. A Buddhist priest walks around the room with a warning stick calmly. The priest hits the right shoulder of the samurai who was about to sleep with a warning stick. The samurai blushed unintentionally, and he joined his hands and inclined the neck to the left and opened the right shoulder. A Buddhist priest strongly hit the right shoulder with a warning stick this time. After the samurai was beat with a warning stick, he joined his hands, and had lowered the head, and he raised his head and stretched out the back and came back to the original posture. Rencho watched it through the window. Rencho felt the force that Zen Buddhism spread out among Kamakura samurais in this way on his skin. Renchō passes Wakamiya main street. It is a gentle uphill slope. There was Tsuruoka Hachiman Shrine in the distance. Yoriyoshi Minamotono of the leader of the second generation of Kawachi Genji erected the Hachiman Shinto shrine. Yoriyoshi invited a divided god from Iwashimizu Hachiman shrine of Kyoto to the Yui volost of Kamakura and built a Shinto shrine and assumed it a tutelary deity of Genji. Since his descendant Yoritomo subjugated the Kantō Region, Hachiman became the god of all the samurai. Therefore, anyone of the samurai according to Genji worshiped Hachiman. "Travel to East", a travelogue of the same era as "Records of Sea and Road", briefly describes the origins of Hachiman Shrine. “In the first place the origin of this Kamakura is that a person said to be late Yoritomo of the right side shogunate was born in the house of the samurai as a descendant for the ninth generation of the Emperor Seiwa. Because Yoritomo won to a rebel against the Imperial government with a soldier of the loyalty in the days of an end of the Jisho era, a reward from the Imperial Court was given frequently, and he was appointed a general. Because Yoritomo established the Shogunate on this land and built a temple and a Shinto shrine in this place, it became the land which is prosperous like now. Especially in the Hachiman shrine of Tsuruoka, green of pine and oak grows steadily, and there is no time when the offerings to god will end. The concert of the four seasons is held after the musical instrument performers are determined, and in August a festival is held to release living things by the appointed official. The ceremony worshiping God is said not to be different to Iwashimizu Hachiman shrine of the main." The gentle straight road continues from Hachiman shrine to the sea. The group mounting a horse come down quietly from Hachiman Shrine on this road. The person who is riding a horse is Tokiyori Hojou and is Tokisuke of the eldest son and Tokimune of the second son. A vassals follows after them. Tokiyori is the regent of the Kamakura shogunate. He was only 27 years old. The regent was lower-ranking than a general of Kamakura apparently. However, the general after Yoritomo became a puppet, and Hojo having the armaments had held power. Therefore, it might be said that Tokiyori of the regent was the real ruler of Japan. Father and children proceed leisurely through Wakamiya Main Street. The roadside crowd avoid the road and lowered heads. "That person is Dear Ms. Saimyoji." Tokimune became a priest at the Saimyoji of the Zen temple. People called him Saimyoji. Seven years old Tokisuke approaches his father's horse. He shows an expressions that he grieves over the world in spite of being a boy. "Dad, is it true that you will quit your regent?" Tokimune of the younger brother approached following an older brother. Tokimune was only 5 years old. The expression of Tokimune was naivete unlike Tokisuke. "Dad, now it is not time to retire. There are many people who criticize Hojo yet. The Shogunate is safe if father is there." His elder brother Tokisuke explicitly had a bad face on him. These brothers are born of different mothers. And it may be the nature of the lineage of Tokiyori. They bared emulousness in everything. "Do not worry, I am arranging for your future"
Father and children drove a horse fast. The holiest how to sit down in Buddhism. Riding in combination both legs on both thighs.This how had been used in the sitting image of Buddha. It was performed as how to sit down at the time of the posture of contemplation.